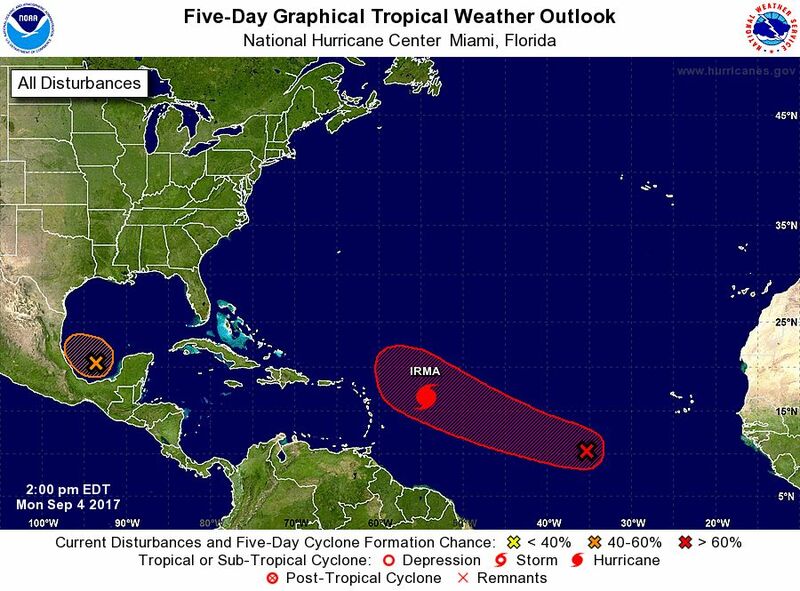 MIAMI - Hurricane Irma strengthened to category 4 on the Saffir-Simpson Hurricane Wind Scale on Monday and additional strengthening is forecast during the next 48 hours as the centre of the storm moves towards the Leeward Islands. According to the National Hurricane Center (NHC) in Miami, at 5:00 pm EDT on Monday the centre of Hurricane Irma was located about 490 miles (790 km) east of the Leeward Islands, moving toward the west near 13 mph (20 km/h). This general motion is expected to continue into Tuesday, followed by a turn toward the west-northwestward late Tuesday. 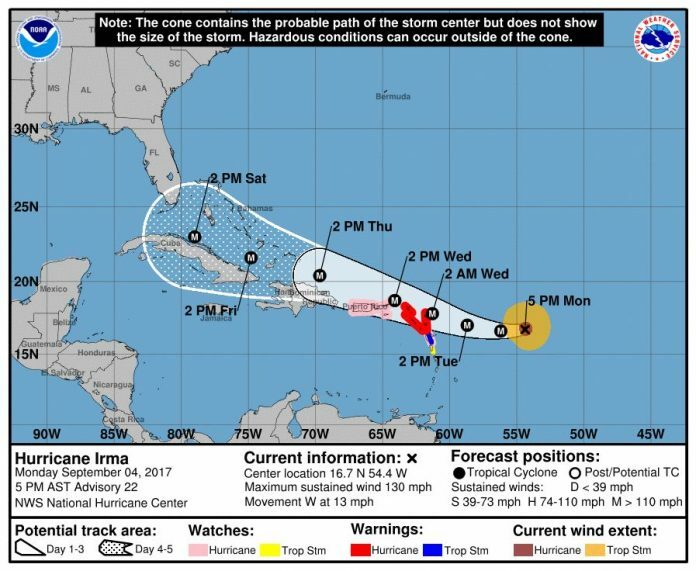 On the forecast track, the centre of Irma will move near or over portions of the northern Leeward Islands Tuesday night and early Wednesday. A hurricane warning is in effect for Antigua and Barbuda, Anguilla, Montserrat, St Kitts and Nevis, Saba, St Eustatius, St Maarten, Saint Martin and St Barthelemy. A hurricane watch is in effect for Guadeloupe, British Virgin Islands, US Virgin Islands, Puerto Rico, Vieques and Culebra. A tropical storm warning is in effect for Guadeloupe and a tropical storm watch is in effect for Dominica. Interests in the Dominican Republic, Haiti, the Turks and Caicos Islands, and the southeastern Bahamas should monitor the progress of Irma. Data from an Air Force Reserve Hurricane Hunter aircraft indicate that the maximum sustained winds have increased to near 130 mph (215 km/h) with higher gusts. Hurricane-force winds extend outward up to 40 miles (65 km) from the centre and tropical-storm-force winds extend outward up to 140 miles (220 km). The combination of a dangerous storm surge and large breaking waves will raise water levels by as much as 6 to 9 feet above normal tide levels along the coasts of the extreme northern Leeward Islands within the hurricane warning area near and to the north of the centre of Irma. Near the coast, the surge will be accompanied by large and destructive waves. The combination of a dangerous storm surge and the tide will cause normally dry areas near the coast to be flooded by rising waters moving inland from the shoreline. The water is expected to reach the following heights above ground if the peak surge occurs at the time of high tide: British and US Virgin Islands except St Croix 4 to 6 ft; northern coast of Puerto Rico 2 to 4 ft; southern coast of Puerto Rico and St Croix 1 to 2 ft.
Hurricane conditions are expected within the hurricane warning area by Tuesday night, with tropical storm conditions expected by late Tuesday. Hurricane conditions are possible within the hurricane watch area in the Virgin Islands and Puerto Rico by late Wednesday, with tropical storm conditions possible by early Wednesday. Tropical storm conditions are expected within the tropical storm warning area by late Tuesday. Irma is expected to produce total rainfall accumulations of 3 to 6 inches across the Leeward Islands, with isolated maximum amounts of 10 inches across the northern Leeward Islands. These rainfall amounts may cause life-threatening flash floods and mudslides. Swells generated by Irma will affect the northern Leeward Islands during the next several days. These swells are likely to cause life-threatening surf and rip current conditions. Meanwhile, an elongated area of low pressure located several hundred miles southwest of the Cabo Verde Islands continues to produce disorganized showers and thunderstorms. Environmental conditions are expected to be conducive for gradual development, and a tropical depression is likely to form later this week while the system moves west-northwestward at 10 to 15 mph over the tropical Atlantic Ocean. The chance of a tropical cyclone forming within the next five days is estimated to be high (80 percent). A trough of low pressure located over the southwestern Gulf of Mexico is producing disorganized showers and thunderstorms. Environmental conditions are marginally conducive for some slow development of this system while it drifts west-northwestward and remains over the southwestern Gulf of Mexico during the next few days.